If any singular exponent of the powerful Turkish Anadolu Pop scene could be described as eclectic it would have to be Ersen. His chameleon image in Turkey has teetered on the edge of versatile and schizophrenic over his 40-year sporadic career and his versatile talents as a vocalist have served as a refreshing alternative to his contemporaries in one of the most progressive musical micro-cultures in the history of rock music. Catapulted into prominence by the first ferocious wave of the Anadolu Pop scene alongside the true cognoscenti of the fledgling phenomenon, Ersen would go-on to record a smash hit single and a string of stylistically disparate records which entertained, inspired, confused, rejuvenated and offend his divided audience in equal parts. By today’s standards Ersen’s erratic creative tendencies makes him one of the strongest Turkish rock contenders to transcend changing musical trends and geographic territories. As a singer he has one of the most unique softly spoken vocal deliveries on the Anatolian Rock scene and as a composer his use of long heavy rhythmical passages punctuated by his signature ‘panting’ vocalisations and throbbing basslines are unmistakable. To fans of early Eastern psychedelic music it will make sense that, although at times in his career Dinleten may have been regarded as an outsider, many attributes of his unique sound are accountable to his open armed acceptance by the originators of the Anadolu Pop scene – primarily, and namely Mogollar and 3 Hurel. As an artist who had started out playing the type of romantic ballads which wouldn’t sound out place in your local Turkish restaurant, Ersen had been transformed into a credible ambassador for the much publicised Anadolu Rock phenomenon and, to some sceptics dismay, he had travelled via rock ‘n roll, traditional folk and pop trends along the way. In some senses the Anadolu rock scene mirrored the likes of Brazil’s Tropicalia movement where social politics could potentially eclipse the music, so when the likes of Ersen chose to remain apolitical he was often criticised by the unduly disappointed radicals of young Turkey. Where the vociferous Selda Bagcan could be compared to Os Mutantes’s Rita Lee, Ersen took the role as a politically pedestrian Roberto Carlos. 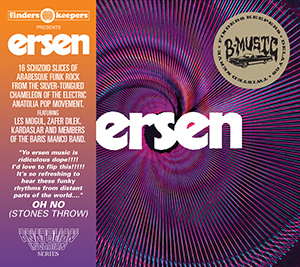 The recent resurgence in Ersen’s music amongst DJs and record collectors and the recent commercial re-appropriation of his tracks via advertising and sampling stands is testimony to his misplaced accessibility. The A-side to Ersen and Dadaslar’s third single ‘Gafil Gezme Saskin’ (Don’t Wander Heedless, Bewildered) was recently sampled by American Hip-Hop producer ‘OH-NO’ as part of Los Angeles based Stones Throw collective who have embraced the resurgence of Anatolian Pop with open arms. Recent joint DJ sessions with label boss Eothen Alapatt and Finder Keepers have witnessed packed dancefloors rocking-out to dozens of rare and unknown Turkish 45s while auction site eBay plays host to hoards of frenzied bidders hoping to secure original copies of Turkish LPs at inconsistent and regularly inflated prices. In 2007 traditional English footwear brand Clarks went to great cross-continental lengths to license the track ‘Gunese Don Cicegim’ for a national TV advertisement which prompted heavy debates on internet forums amongst hungry vinyl junkies trying to identify the mystery track.